Sephora recently launched a special Play! Luxe by Sephora Box Volume 2. (This box is a one-time-purchase and separate from the subscription.) This review is of that limited edition box. This Play Luxe box comes with a limited edition beauty bag, too. The Cost: $25 and a one-time purchase, not a monthly subscription. Check out all of our Play! 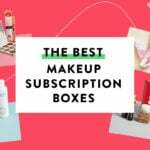 by Sephora reviews and all of our reviews of Beauty Subscription Boxes! Exclusive Sephora Makeup Bag – Value $10? The bag has a detachable wrist strap, zipper closure, and purple satin lining, too! One word of caution with the fragrance, though. If you don’t like the scent, don’t use this thinking it will wash out when you rinse. The scent stayed with me til my next shower! Don’t you love it when one product alone is worth more than the entire cost of the box? And Tata Harper is such a fab (and pricey) ingredient-conscious skincare line, that it’s extra great! I’ve sampled this serum before, and it’s a treat! I love the natural scent, it’s gentle on my skin, and it hydrates and plumps my skin instantly, too. If you’ve been following my reviews for a while, you may know that Tatcha is one of my all-time favorite skincare brands. They are ingredient-conscious, the formulas are so gentle, and I swear they work on my skin like no other brand. I can actually tell a difference when I stop using Tatcha. This water cream is just as hydrating as it sounds, and it’s designed to help with both dryness and uneven texture. (This rollerball is half the size of the full-size roller ball!) The scent is a mix of Black Truffle, Black Orchid, Black Plum, Noir Gourmand Accord, and Patchouli. The fragrance is very strong, so this little bottle should actually last a while! This is a color-changing lipstick that reacts with your pH to give you a unique berry shade. It’s a new-to-me product, and I love it. (Plus it’s fun to have a black lipstick in your makeup bag going into October/Halloween season!) The formula is sheer, it gave my lips a natural looking berry tint, and it’s moisturizing with a slight sheen. Verdict: This box has a value of approximately $103.57 not counting the makeup bag. I think the value is great, and I feel like this box was curated for me – SO many of my favorite products! I highly recommend it if you are considering it! Can I still get this box if I sign up today? Yes! As of 9/25, this box is still available! What do you think of the Play! Luxe Sephora box Vol. 2? Did you grab one? I don’t see the value in these play luxe boxes. They don’t seem different to the $10 ones to me. What gives? Oh, and they are not what I would call luxe. Someone get net-a-porter to teach sephora what luxe means! CR hair mask? O boy! What a complete waste of money. Buy a nice full size item instead of these minis from not luxe products. It looks like a great bag! The bag itself is so retro, I love it! I’ll have to wait a week before splurging again. Sephora gets a lot of my dollars. I like this bag, super cute and I LOVE that perfume. Such a wonderful fall/winter smell and it has great staying power without being too overwhelming (for me at least). Also that serum looks amazing. I might buy this but I’m also getting ipsy plus. So I don’t know yet. October is going to be a tight month money-wise. Love this bag and everything in it! I’ve got two of them! Did anyone notice on the Tata review someone posted about grey globs at the bottom of their serum sample? Pics included are quite offputting. That said, I’m still tempted to try this Play bag. I saw that review with the grey blobs! But Sephora has now removed that review!!! How disgusting! The products are nice. I wish that they wouldn’t put fragrances in these bags though. I purchased the first luxe box and the perfume leaked all over me. Unfortunately, I’m one of the people that can’t wear or smell the majority of fragrances, as they make me violently ill.
Got my bag yesterday and immediately ordered a second. I was really happy with it. I especially love the Givenchy!! It reminds me of Clinique Black Honey, but it’s so much better. And the bag is super cute — I’ll definitely find a use for it. Is it weird if I use this as a purse? I love the puffy look! I feel like it’s a good size and style for pumpkin picking and apple orchard outings. Plus, I like the wrist strap. I felt like this was a great lot. I’m excited to try it all! Although, I didn’t like the Black Orchid scent. Does anyone know if it fades nicely? Trying to decide if I should try it on or give it away. I don’t think it’s weird. 🙂 I was planning on using the bag as a little wallet on occasion! Oh! And I tried the Black Orchid on, and while it did smell quite intense to me upon application, once it aired out a little I thought it wore down nicely. I could still get whiffs of it when I moved around, but nothing too bad. That’s good to know. I’ll have to try it out. I was actually really impressed by this bag. I’m tempted to grab one thanks to this review! Interesting. I just noticed that Liz valued this special edition bag at approximately $103.57 but the Sephora website lists it as only an $83.00 value. I wonder if Sephora valued it based on the original bag description that was missing one of the items? Liz’s description breaks down the valuation, so I think her valuation is more accurate. Also had to laugh: there are now 10 reviews/ratings posted for this item on the Sephora website, but the review counter at the top is still stuck at 3, which I believe is where it was when they updated/corrected the item number description. Depending on your website configuration, postings can be tricky to update, but I’m surprised since Sephora has an established web presence. I got mine today, as well. I am disappointed. Tatcha was a 100 points reward, Tata Harper a GWP, Tom Ford you can get for free (in a mini bottle) at the counter in any high-end department store if you ask nicely, Christophe Robin is boring and was featured in a Look Fantastic regular box, Hourglass is everywhere, including Ipsy. Only Givenchy and the bag itself are original. I don’t see the value. I don’t know why you bought it then. Also, the serum for the GWP was a different Tata serum the resurfacing serum. I personally love Sephora’s luxe bags and will continue to buy every last one. Why anyone would throw money away on something they are going to complain about is beyond me. Might as well walk outside and light your wallet on fire. I am glad you love yours. I appreciate your concern about my spending habits. I happen to agree wjth you. The items are samples that come in every $10 sub out there. I don’t see a value over $10 let alone $83 or $100. Haha what a joke! Customers want to see a value of at least 2x the cost of the box. There is no $50 value here and the products are repeats as usual. Don’t waste your money. For $21 you can get 5 full size items from glossybox. The item description posted by Sephora only lists the brand and category of item, not the specific items. Its impossible to tell what you’ll be getting, so I’m sure there are people who were hoping for something other than what was actually included in this box. But it’s poor marketing on Sephora’s part since it inevitably leads to some disappointed customers. I think that $22 is way overly generous for an black orchid sample… Considering 3mL is 10% of the 30mL size which is $86 at Sephora, $8.60 is more accurate. Also the 1.5 mL samples are free in store. You could get 3mL worth of the perfume decanted or as the samplers probably for $10 shipped via amazon… And I say all of those as someone who’s favorite perfume ever is Black Orchid. Over valued in the review. The Tata Harper makes it worthwhile if you like that product, and the Rouge Interdit looks interesting. But personally I don’t think perfumes should be included as one of the regular bag items, especially if you’re going to say it increases the bag value by $22.50 because scent is such a personal thing. Macy’s gives away scent samples for free with their beauty purchases, and that I appreciate. I also don’t think foundation samples should ever be included as part of a box, because they rarely work for the majority of recipients. The foundation cards that have blisters of multiple shades sometime work, but again, I like them as an additional freebie so that it doesn’t cost anything if they don’t work out. Thanks for the review. I just ordered one. I can’t wait to try the mascara. I love Tatcha cream and the black lipstick looks fun. I’ve tried that Tata serum and can’t get past the smell. It’s a nice lightweight product and I’m sure it works great but the smell is yuck. I tried to give my last sample to my mom and she couldn’t take it either. I am going to buy this for that Tata Harper serum alone! I had a deluxe sample and love it do much! Thank you for the excellent review, Liz!